In our house, we love Pete the Cat, so I wanted to create a C.H.A.R.M.S. session is based on the book Pete the Cat Saves Christmas. C.H.A.R.M.S. is an acronym for kids to have their own morning ritual and stands for- Creativity, Health, Affirmations, Reading, Meditation and Service. To find out more about C.H.A.R.M.S., check out this podcast with Julie Neale of Mother’s Quest. You don’t have to do them in order or even do all of them. Take what works for you and leave the rest. For this session, we will start with Reading. If you have the book, great! If not, feel free to use this video instead. 1. In the book, when Santa was ill, he called Pete the Cat to help him. Who could you count on if you needed a helping hand? 2. In the book, Pete the Cat says, “I can do it! And although I am small at Christmas we give, so I’ll give it my all.” Can you think of a time when you felt small, but by working hard you still reached your goal? 3. At the end of the story, there was a celebration for Pete the Cat’s success. What was your last success and how did you celebrate it? Or what is your favorite way to celebrate your accomplishments? 4. Let’s “rewrite” the story. If you were the author how would you have Pete the Cat save Christmas? 5. Pete the Cat gave his all in the story, what are some ways we can give our all this Christmas? Possible affirmations for this story include: I am a Giver. I give my all. I am committed to taking small, consistent actions to reach my goals. I am a good friend. I am kind. What other affirmations can you think of? Have your kids say these statements out loud. For Creativity, print out this maze and help Pete get to the North Pole. For additional activities including a dot-to-dot, a word scramble and a drawing exercise click here. Now that Pete the Cat has made it to the North Pole, he needs some reindeer to help pull his minibus. These will be healthy, edible reindeer to cover Health! You probably already have everything you need to make them in the pantry. Start with a rice cake, apple or any other circular base (cookies work, but are obviously not as healthy). Next, spread your favorite nut spread- my personal favorite is Justin’s Vanilla Almond Butter. If your family has allergies (or your making these for a nut-free classroom) Sunflower seed butter is a great alternative. 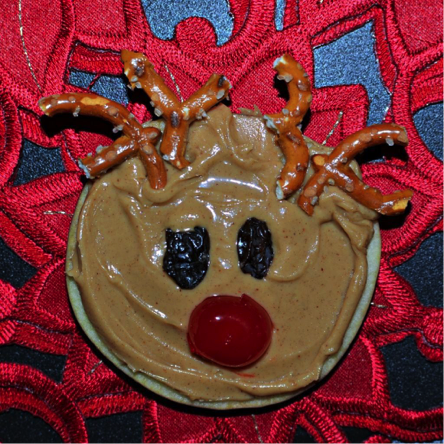 Now add raisins for eyes and the nose (or a cherry or dried cranberry nose if you’re making Rudolph ;). Lastly, add some pretzel antlers and enjoy! If you’re doing this activity with many children, here is a Reindeer tag game to get their heart rates up (think- Red Rover). Create a line called the North Pole and have all the children up there. Allow the kids to pick one of the Reindeer names: Dasher, Dancer, Prancer, Vixen, Comet, Cupid, Donner, Blitzen or Rudolph. One child is “Santa” and stands in the middle. “Santa” calls out the reindeer names one at a time and anyone who picked that name will run or gallop across while Santa tries to tag them. If a reindeer gets tagged, then they help “Santa” tag more reindeer until only one remains. That person then becomes the next “Santa” and the game starts over. To modify for fewer children, try it as red-light, green-light instead. The person at the end is Santa and the reindeer need to get to him as fast as they can. Now that they got all their wiggles out, it’s time to slow things down with a Meditation. On the last page of the book, there is a Christmas tree decorated with red balls and a star on top. Show this picture to your child before the meditation to help them visualize themselves as that tree. Encourage your child to sit up tall in a chair with their feet on the ground and read this Guided Christmas Tree Meditation them: Sit up tall and take a deep breath in. As you close your eyes and breathe out, picture yourself as a Christmas tree. Feel your trunk going down into the ground and your roots reaching deep down into the Earth. Imagine you are decorated for Christmas with colorful, red balls. Each ball holds Christmas magic. Imagine the balls filling up with any thoughts or feelings that don’t bring you joy. Maybe you’re worried about a test you have coming up or you had a fight with a friend. Whatever thoughts or feelings you don’t want to hold onto, place them inside a red ball and imagine it drifting high up into the sky until it’s out of your sight. Continue filling up the balls until all you have left in your heart is pure joy. Let me know when that is (pause here until your child is ready). Now, bring your hands to the top of your head and imagine bright starlight shining out from the top of your head and radiating your joy to all you come into contact with today. As you gently open your eyes, let a big smile come across your face, knowing today will be a wonderful day! The last of the C.H.A.R.M.S. is Service. The holidays are a wonderful time to help those who are less fortunate than you. Perhaps you can have your child “adopt” another child to buy gifts for. Have them make handmade cards for soldiers or other kids who are hospitalized over the holidays. They could give their time to go sing carols at a local nursing home or be a helper in the kitchen making cookies for the neighbors. Use question 5 above to help brainstorm with your child how they can give this Christmas. I’d love to hear your ideas! I'm grateful for Pete the Cat and the many lessons he has taught my kids through his stories. I"m grateful for this joyous time of year where faith, giving, receiving, family and light are all celebrated. I'm grateful for all the blessings I've had this year and wish you a safe and warm holiday season. I'd love to connect with you. Please join the conversation in our Facebook Community.